Premiere: 25 July 2008. Also played 3, 6, 10*, 16, 28 August. 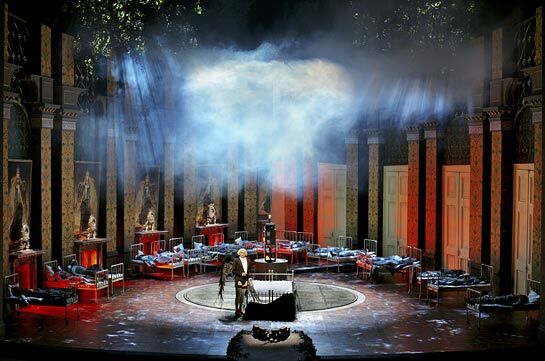 Stefan Herheim and his team consisting of Heike Scheele (stage design), Gesine Völlm (costumes) and Alexander Meier-Dörzenbach (dramaturgy) has created a multi-layered, ambiguous, interesting and very beautiful production of Parsifal. They succeed in creating a veritable dream world on stage. The production mixes irony with sincerity and kitsch with heartbreaking tragedy, and the end result is an overwhelming emotional experience. If Herheim had wanted to make a more traditional production, he would have chosen one of the story lines and developed it to a rounded whole. Instead the production points in "all" directions. This is not a weakness, but a strength. In doing so, he is true to the abyss of anxiety, doubt, desperation and longing (both for love and for redemption!) found in the music. The redemption that we are offered in this production is filled with irony and doubt. The basis for Herheim's interpretation is his apparent musicality. Right from the instrumental prelude, where the actors are mutely playing out Herzeleide's death, the action on stage corresponds deeply with the musical flow – often with great emotional impact. In Bayreuth I think only Harry Kupfer has been close to Herheim in this respect, maybe also Patrice Chéreau. This correspondance creates both parallels and contrasts between the action and the music (for instance with the ironic circus lights that are turned on when Parsifal sings "Wie dünkt mich doch die Aue heut’ so schön!"). Herheim enters a dialogue with the work, opening it up, creating doubt, as well as new questions, and a fascinating play with identities. Instead of answers, Herheim raises several new questions for every one he answers. Kundry appears as Klingsor at the end of Act 2 and like Amfortas in Act 3. Conductor Daniele Gatti was first very sceptial about playing the preludes for open curtains. Luckily he was convinced. The pantomime playing out Herzeleide's death during the prelude of Act 1 is marked by great originality. The pantomime follows the triptychon structure of the prelude. We are in Villa Wahnfried. Herzeleide is lying in a bed. She is dying. She is desperately trying to make the son, Parsifal, come to her, but he is afraid and refuses. Three times he rejects Herzeleide's invitation, but eventually he is forced to come to Herzeleide's bed by the maid. Present is also the doctor and the priest. When Parsifal runs out to play with his bough and arrow, his mother dies. In the second part of the prelude Herzeleide's dead body is prepared by the doctor and the priest. 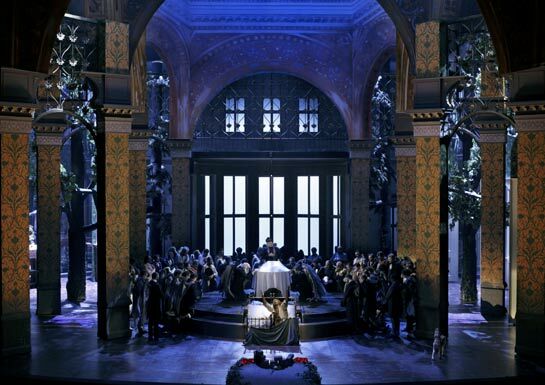 The third part of the prelude starts with Parsifal entering the room where his dead mother is lying. Herzeleide is transformed to Kundry with a red rose. The dead woman then starts to move. She starts trying to seduce Parsifal and make him come into the bed. This scene has (at least) three parallel scenes in this production: Herzeleide and Gamuret making love, Klingsor luring der Knabe (Parsifal) into his bed, and Kundry trying to seduce Parsifal in Act 2. Parsifal is building a wall on Wagner's grave. The building process is also shown on a screen in the rear part of the scene. The Wall is obviously a reference to Pink Floyd's The Wall with its parallel theme of repression and the consequences of repressing. Parsifal's building of the wall is also a reference to the rebuilding of Villa Wahnfried after the war (Parsifal's wall is very much like the wall seen on post war pictures of Villa Wahnfried in ruins). There's also a reference to René Magritte's painting The Art of Conversation. There may well be more references. They are all part of the open non-didactic character of this production. A very beautiful effect was the mirror that slowly descended from the roof, showing the audience as well as the orchestra and the conductor in the hidden orchestra pit. Some critics have regarded this mirror as too obvious a metaphor for the stage as a mirror, and for the rather commonplace idea that "now it is up to us to find the way". Such a one-dimensional reading, however, ignores the ironic filter established early in Act 1, forcing us to doubt every "statement" Herheim seems to be making. 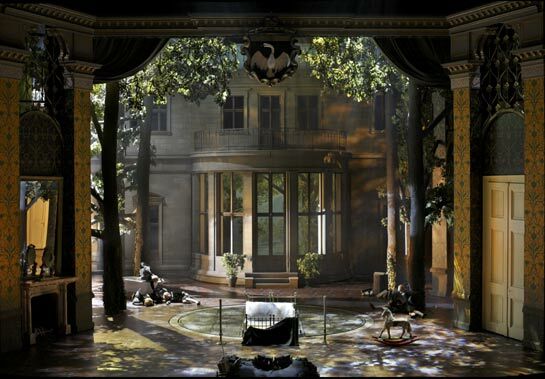 The mirror showing not only the audience, but also the orchestra and the conductor, is a message from the production team: – Hey, look here, there's more in this music drama than has been seen here before – not to mention that there is something hidden and repressed concerning the past in Bayreuth and in Germany. Herheim and his team make us see something we were not meant to see. 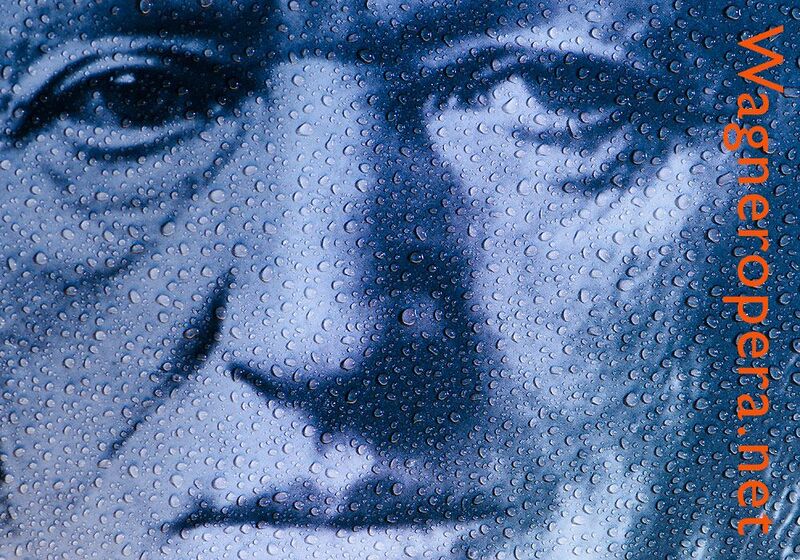 Wagner and Bayreuth have tried to hide it, but now is the time to open up. Sleep is a recurring motif. Associated with sleep is death. Sleep and death is the opposite of pain (Amfortas) and restless wandering (Kundry). Amfortas is "schlaflos von starkem Bresten" (sleepless caused by great pain) and Kundry was found by Titurel as he built the castle of Monsalvat "schlafend hier im Waldgestrüpp, erstarrt, leblos, wie tot" (asleep in the undergrowth, stiff, lifeless, as if dead). 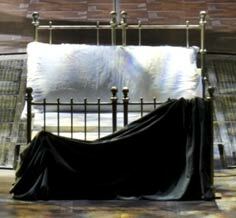 The sleep motif in Herheim's production is mostly associated with the bed. The bed is introduced in the prelude as a death bed. Parsifal's killing of a swan is a crucial event, both in his life and in the history of the Brotherhood. It triggers a process that ends with Parsifal in the role of The Redeemer (der Erlöser) replacing Amfortas as King of the Brotherhood. As the editor of the Monsalvat web site mentions in a note to his translation, "the swan is borne away to the accompaniment of a muffled drum, as if it were a human funeral". Stefan Herheim takes the symbolic meaning of the Swan one step further – Parsifal kills himself as a child, or rather: his traumatized childhood. Instead of a swan, the little boy Parsifal is carried in. The rest is repression, building a wall, building the castle Monsalvat to guard the Grail, building Villa Wahnfried, building the Festival House. The swan scene is a good example of Herheim's play with time and identities. In the scene where the swan is killed, Parsifal is present both as a young boy and as a young man. At another time he is a grotesque old man with the body of a young boy. 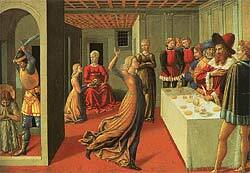 It reminded me of Benozzo Gozzoli's Salome painting, where three events take place at the same time in the same house: Salome dancing for her father, the beheading of John the Baptist, and Salome with the head of John on a silver plate. Time has a new meaning in Herheim's Parsifal. He takes the elements from Wagner's music and text and intensifies their meaning. This production is much more true to Wagner than any traditional production of Parsifal has been. The simultaneous action from different time periods is very effectively contrasted with the linear timeline of the history of Germany serving as a backdrop for the production. Right after Parsifal is born, the maid (Kundry) carries the bloody baby around like it was the grail. She is then expelled from the house. Anti-Semitism is one of the last taboos on the Wagnerian stage. The Jews were conceived as child kidnappers and were accused of drinking the blood of Christian children. The symbolism in this scene is ingenious. Kundry is a Jewish character, being a female equivalent to the Wandering Jew (Ahasverus, der ewige Jude). She laughed at Christ hanging on the cross, and was as a result doomed to live forever, never finding salvation. Kundry's death wish is just as desperate as Amfortas's. Both see death as the only solution to end their misery. The whole drama through, Kundry wants to rest, to sleep, and her wish is fulfilled in the end when she is baptized and sinks dead (entseelt) on the ground, two solutions the anti-Semite Wagner found appropriate. Kundry has no future. Both Katharina Wagner and Stefan Herheim has brought the German anti-Semitism to the light with their productions of Meistersinger and Parsifal. It has certainly been done before, but not in Bayreuth. In a television documentary about the Bayreuth Festival (they showed it on a big screen in the hotel I stayed) an elderly woman talked about how she every day went up to the Festspielhaus. She had so many good memories from the time Unser Seliger Adolf (our blessed Adolf) was in charge. The reactionaries whistling during the music this summer and booing when they saw the swastikas in Act 2 are proof that the past is more present than many would like to think. Wagner said very clearly in Judaism in Music that the only thing that can redeem Jews from the burden of their curse is by going under, which he calls the redemption of Ahasverus. This is Kundry's destiny. In Herheim's production, though, Kundry survives as Gurnemanz's wife. The family with two children are standing facing the audience at the end of the evening. 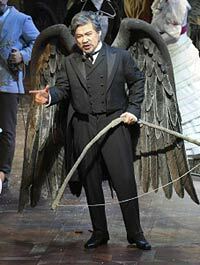 The characters in this production are often equipped with wings. 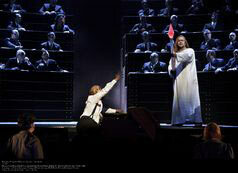 The bird is a recurrent motif in Parsifal (swan, dove and Kundry who can fly). The wings suggest the dream nature of this Parsifal. Is the whole story a dream or is it real? The wings also suggests that this Parsifal production is about the history of Germany (the eagle being the central figure in Germany's coat of arms). Are the winged persons on stage good or evil? Why are the wings black or grey? Are they death angels? Again, there are no simple answers. And if you are convinced that you have the "right" answer, this probably tells more about you than about the production. If there is one thing this production warns us about, it is the saviours who think they have the solutions and the answers. When Parsifal enters the Bundestag as der Erlöser, he is a hippie, totally ill-placed. This guy may think he is offering redemption, but obviously no-one believes him. The redemption has a bitter taste to it. No one could tell how the future would be with this guy as a Führer for the Brotherhood and for Germany. Although the three acts are very different in style and atmosphere, there are certain visual elements binding the acts together. Most important is the bed. 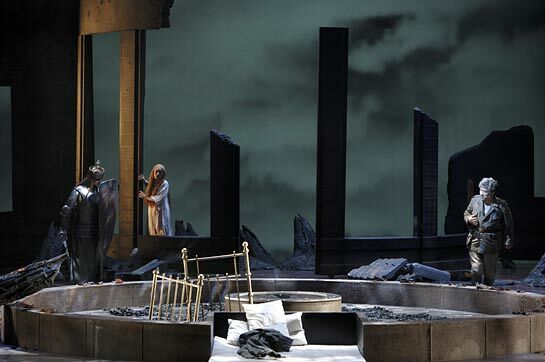 The bed has been destroyed in Act 3, thus leaving us bewildered: Can the cycle of birth-death-rebirth continue when this central element is destroyed? 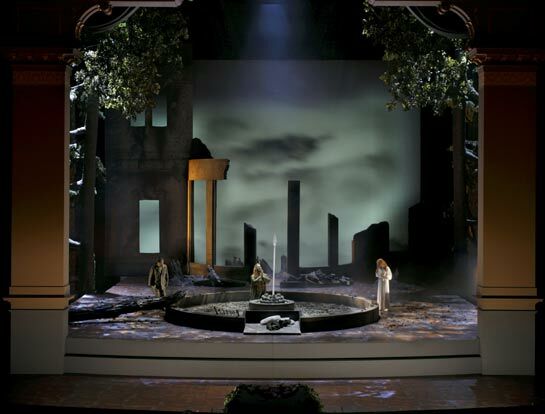 In this production, Stefan Herheim has included an homage to his former teacher Götz Friedrich by quoting the alleged, once so scandalous ‘working class procession’ from Friedrich’s 1972–78 Bayreuth Tannhäuser (now released on DVD). A procession of exhausted cleaning women enter the stage and are included to take part in the “Wirtschaftswunder” that appeared in Germany after World War 2. Before I went to Bayreuth, I thought that this kind of production would benefit from a fast reading of the score, but Daniele Gatti proved that wrong. Gatti's slow tempi added great tension to the dream world we were witnessing on the stage. Detlef Roth (Amfortas) and Kwangchul Youn (Gurnemanz) were both outstanding. Christopher Ventris started a bit anonymously but worked himself up to deliver a great Parsifal. Thomas Jesatko as Klingsor was very impressive, emphasizing more the irony and the tragedy than we are used to from this villain. 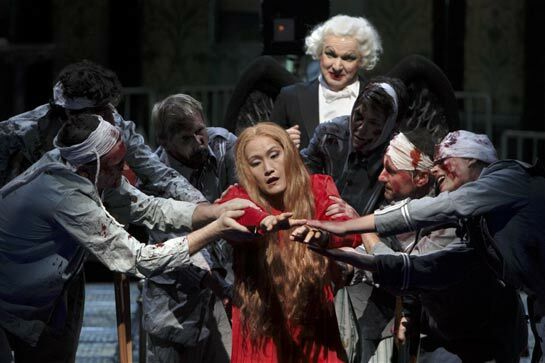 Mihoko Fujimura as Kundry acted her part very good, and if we overlook some problems with the high notes, her beautiful, almost sinister voice suited the production well. The singer-actors acted as a team, not as individual stars. And that kind of teamwork is what we want to see in Bayreuth in the future. The technical complexity of the stage machinery is breathtaking. Walls appear and disappear, making the stage a breathing, living organism. The ever changing sets correspond to one of the main ideas of this production, namely that ideas and identities are constantly changing (not always for the better, as the history of Germany has shown), and that stagnation, moralism, absolutism is dangerous. Redeemers with static solutions should be avoided. What really makes this production great is the abundance of energy that went into its creation. The singer-actors, the conductor, the stage crew, the costume department and all the other involved seem to have been genuinely eager to create something out of the ordinary. 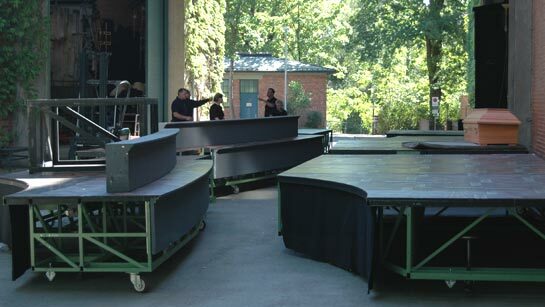 Scene workers preparing the sets for the Parsifal performance on 6 August 2008. "Im Grabe leb' ich durch des Heilands Huld. Zu schwach doch bin ich, ihm zu dienen. 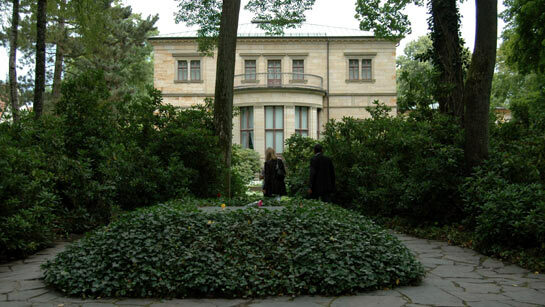 ": Richard Wagner's grave in the garden of Villa Wahnfried.